Aunts are cool. They bring back tales of far-off adventures and walk through the door with large smiles and pockets full of candy. They never forget a birthday. This year, bring joy and light to your aunt's day when you wish her happy birthday. Just as she's treated you like the most special person in the world, it's time to do the same for her on your aunt's birthday. 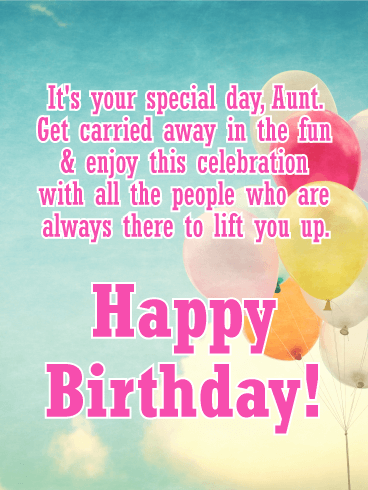 For an aunt who's amazing in every way, this fun & festive birthday card is sure to make her day! A brightly wrapped birthday gift is bursting with confetti. Next to it, a delicious cake topped with candles sits waiting for her to make a wish. And of course it's going to come true because she deserves all the fun and happiness coming to her. Your aunt has so many wonderful gifts. And they're all captured here in this sentimental birthday card! A colorful cupcake is topped with a single candle, symbolizing her bright smile and sweetness. And her loving spirit is something that comes through in everything she does. With its heartfelt words, this greeting is a wonderful way to wish her a celebration like no other. For an aunt who's very special, this is exactly the kind of birthday card she deserves! A cake topped with lots of bright, colorful candles sets the scene for a sweet celebration for someone you care about so much. And the simple yet sentimental words will let her know that you're sending your biggest and best wishes her way. 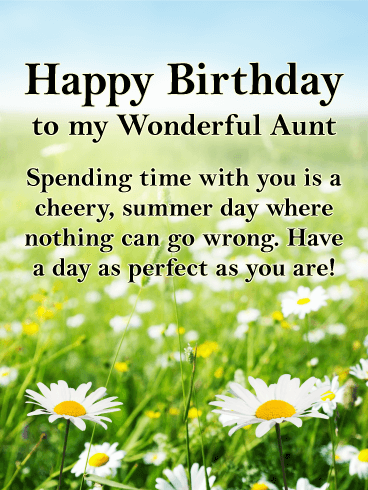 A field of lovely daisies creates the perfect backdrop for the caring words in this birthday card to a wonderful aunt. It's a way to let her know how much of an impact she has had in your life while wishing her a day that's full of beauty and joy. She'll be smiling as soon as she sees it, knowing you took the time to wish her well and let her know how much you love her. An adorable kitten sits in a field of pink flowers, bringing a sweet and sentimental touch to this birthday card for your amazing aunt. It's a chance to let her know how much she's touched your life with her loving nature and kind spirit, while giving her a reason to smile, knowing just how much you care. 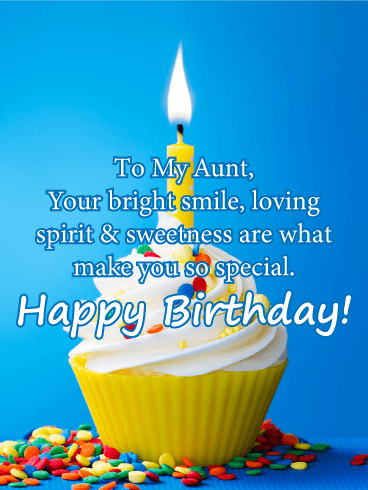 This charming and colorful birthday card will have a special aunt in your life smiling bright! 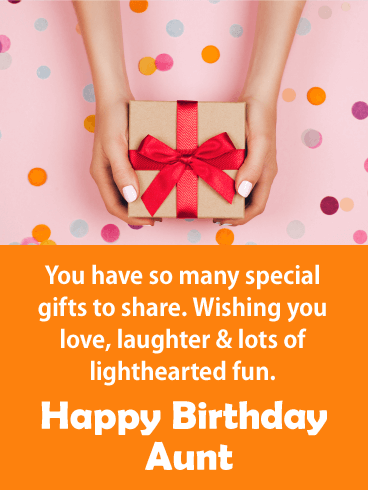 Featuring a lovely wrapped gift and festive confetti sprinkled about, it comes with your wishes for love, laughter and lots of lighthearted fun as she celebrates another year. With its sweet message, this greeting is the perfect way to let her know you care. A bunch of colorful balloons float in the bright, blue sky, creating a backdrop fit for a birthday celebration! And the recipient? 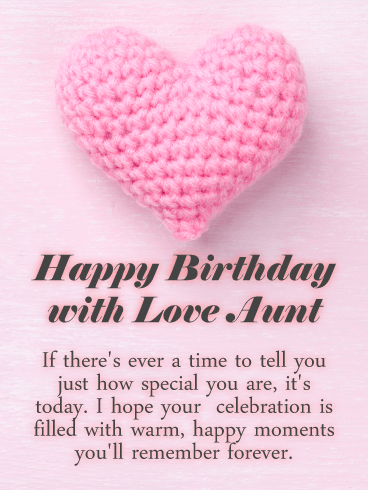 A special aunt in your life. With a festive tone, it's a wonderful way to let her know that it's her day to get carried away in all the fun with the people who love her most and who will always be there to lift her up, especially you! What's more fun for someone special's birthday than bunches and bunches of colorful balloons? Set the perfect tone for a party by sending your awesome aunt this festive card, which is full of your heartfelt sentiments. It's a chance to wish her a day that's unforgettable from start to finish and that will take her to new heights of happiness. Nobody deserves it more! Your aunt has encouraged you to let go of boundaries. Stand on your tip toes and reach. Today, on her birthday, let her know that she can do the same. Wish her luck reaching for anything from adventure to the present hidden on the top shelf. 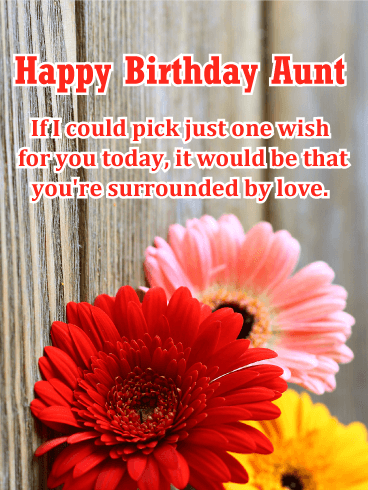 Because birthdays are full of possibilities and today your aunt's are endless. Of all the awesome ladies in your life, your aunt is near the top of the list. Full of jokes and an upbeat attitude, she's always been a role model. Being her would be amazing. Keep her strength up this year with these heartfelt birthday wishes. 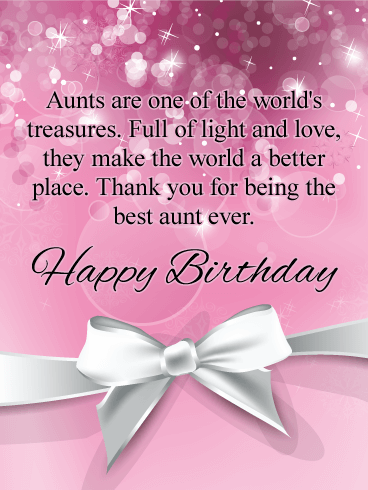 Your aunt deserves the best year possible, and you can guarantee it by sending her this birthday card! Aunts are the women who whisk you away from your parents into fields of fantasy. The park behind your house became the entrance to Wonderland and basement became the Kingdom of Camelot. They transform the ordinary in the extraordinary. Send a birthday card that turns her house into a summer field, a card that transforms a regular birthday into a perfect one. Wish your aunt "happy birthday" and know she got it. They say a single flap of a butterfly's wings can have a drastic effect. The same could be said of every aunt's visit. Every time she let you stay up past curfew, or snuck you sweets, or praised your drawings she helped you become the person you are today. 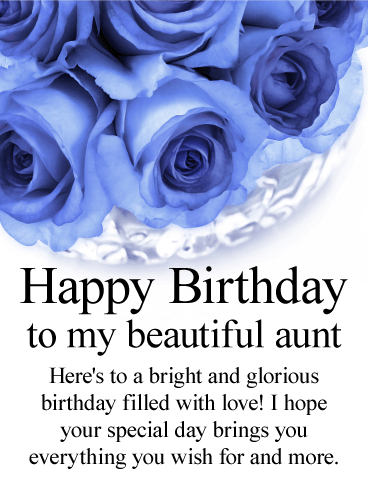 Wish your aunt a happy birthday and watch the power of your emotions ripple out and make her day better. 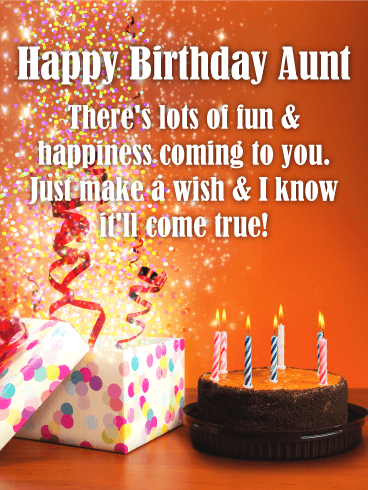 Your wishes can transform anything, and today they will make your aunt's birthday spectacular. We may not be able to choose our family, but you would have chosen to be your aunt's relative anyway. She's your older friend, the woman you go to for advice on all manner of things. Together, you happily chat around a restaurant's table until closing. You're family and you're friends. So reach through time and space to toast your aunt! Celebrate her birthday with her. Show your aunt she's loved. Wish her "happy birthday" with all your heart. Fireworks have always been a marvel; a large, beautiful, and bright piece of art condensed in a small space. Your aunt's smile has always been the same - so get ready to watch it explode with joy when she gets this card! 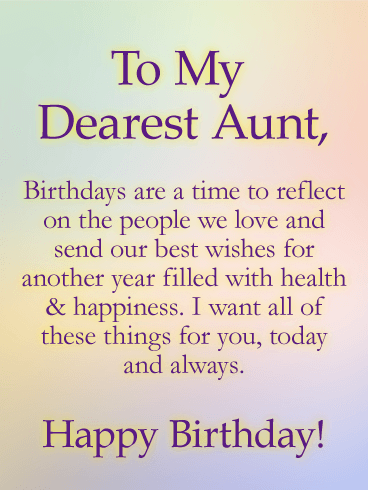 Wish your aunt a birthday, nay, a year, that stands out from all the rest. Wish her busts of joy every single day. Do it by sending this card. 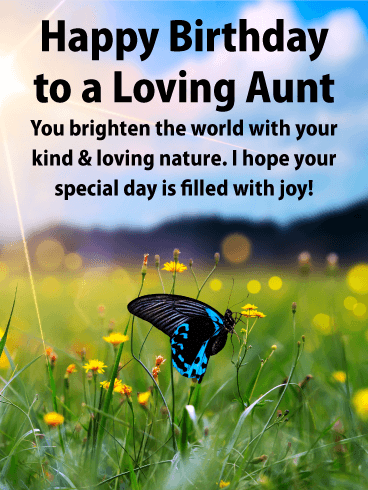 Here's to a fabulous aunt! 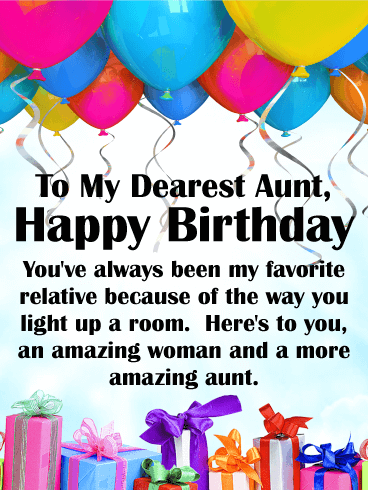 Wish your favorite aunt an amazing birthday and send her this snazzy birthday greeting card. Festive pink balloons and chic gold and black lettering make this birthday card one-of-a-kind. 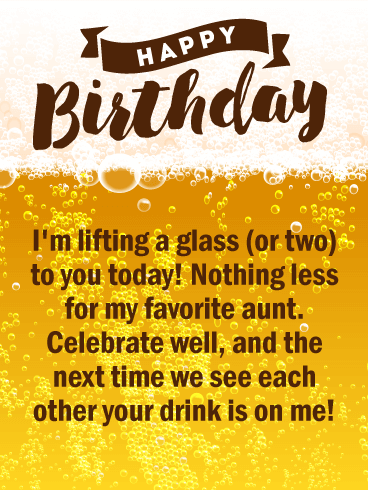 It's a super fun way to celebrate your aunt's birthday in style. 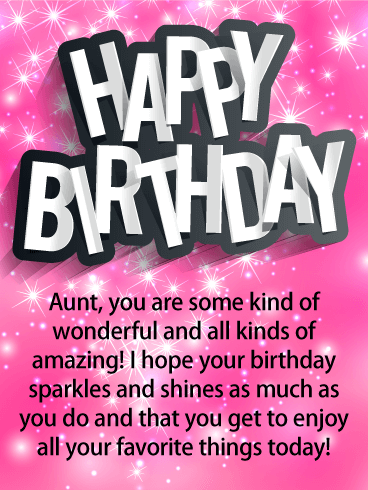 Send this glittery birthday card today and put a smile on your aunt's face. 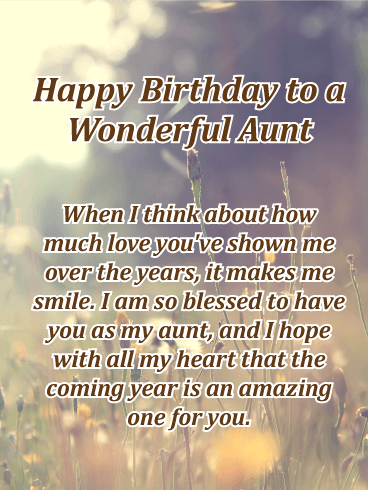 Time to celebrate your wonderful aunt! This festive birthday card is just perfect for your sweet aunt. 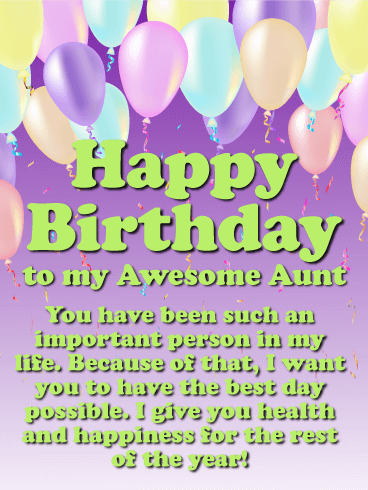 Fill your aunt' birthday with tons of glossy balloons and a thoughtful birthday message to make it a great day for sure! Wish your aunt a blessed year ahead with this bright and colorful birthday greeting card that will be a fun treat to get in her inbox. 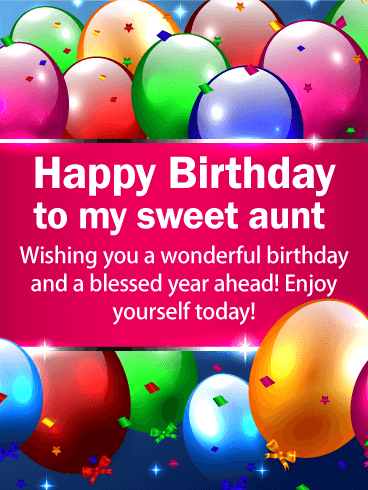 It's never been easier to send a thoughtful birthday message to your aunt! A blue rose is quite rare, just like a cherished aunt. 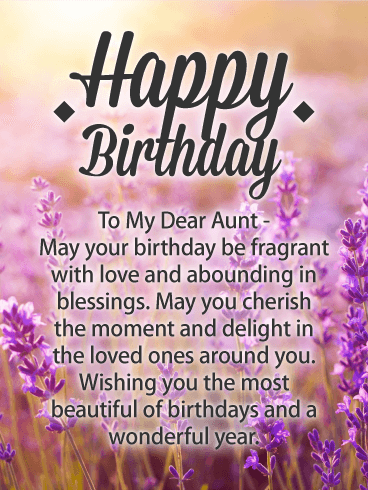 If you have a special aunt in your life, take a moment to send her a gorgeous birthday greeting card that will take her breath away. 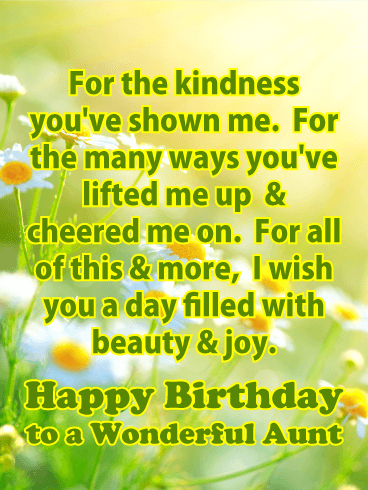 The birthday message on this card is simple but sweet and full of good wishes for a wonderful birthday. 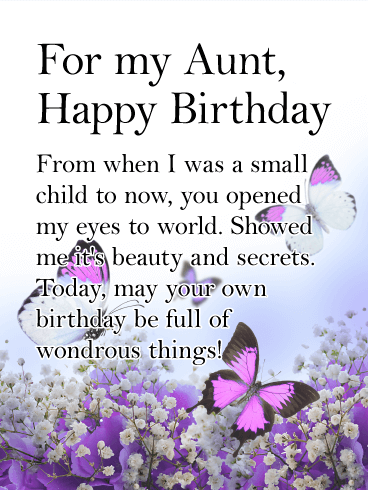 Why not send your aunt this beautiful birthday card today? It's easy, fast, fun and sure to make your aunt's birthday even more special! The love of an aunt stretches far and wide. 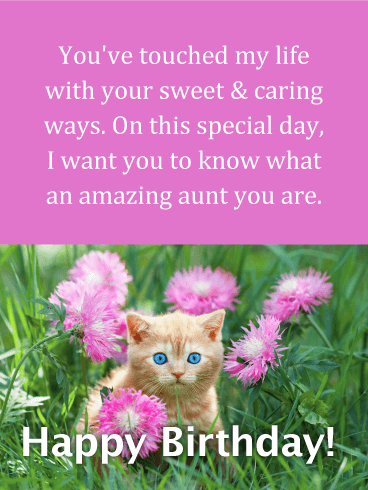 Celebrate the beautiful life your aunt has lived with this touching birthday greeting card. This pretty birthday card with butterflies and dragonflies, with iris and hydrangea blooms is more than a delight for the eyes. The heartfelt message expresses love to your aunt for the positive influence she has had on your life. Let your aunt know how thankful you are for her when you send this attractive birthday greeting card. Some aunts really take the cake! If your aunt is all that and a bag 'o chips, if she's the cherry on top, and all that jazz, well this stylish and groovy birthday card is for her! 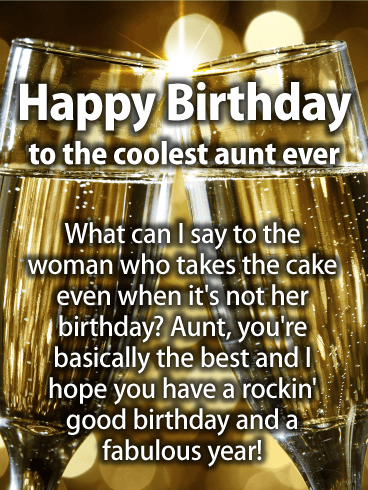 To the coolest aunt ever, we lift our glasses high in a toast to her awesomeness! 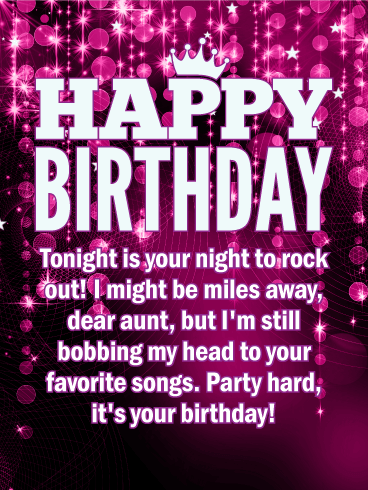 Wish your aunt a rockin' good birthday when you send her this fun birthday card today. Aunts are like a fine red wine-they just get better with age! 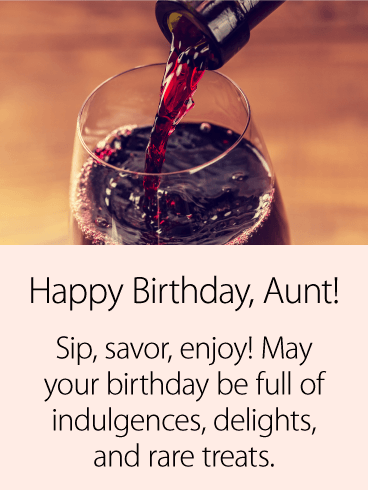 Send this birthday card to your wine-loving aunt and remind her to indulge in all her favorite treats today. Her birthday is a time to sip, savor, and enjoy her life to the fullest. 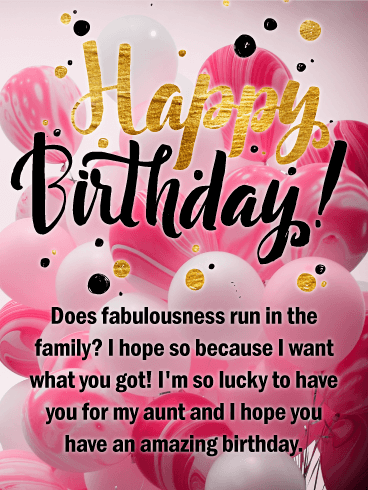 Put a smile on your aunt's face this year on her birthday when you spoil her with this attractive birthday greeting card and perfect birthday wish. We all have that one aunt who is a real firework! She lights up our life with her free spirit and bright energy. 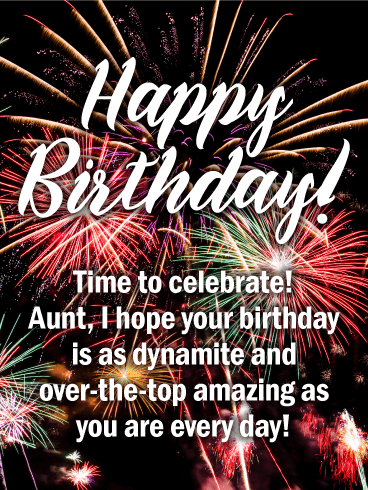 If you think your aunt is really dynamite, send her this celebratory birthday greeting card today. It's a blast of vivid colors. Firecrackers are always a terrific symbol for joy and life and celebration. 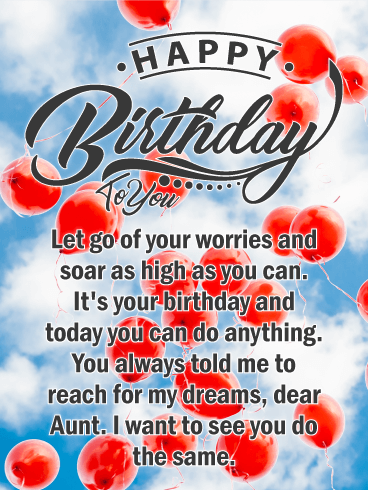 Let your aunt know how amazing she is and send her this awesome birthday card today. 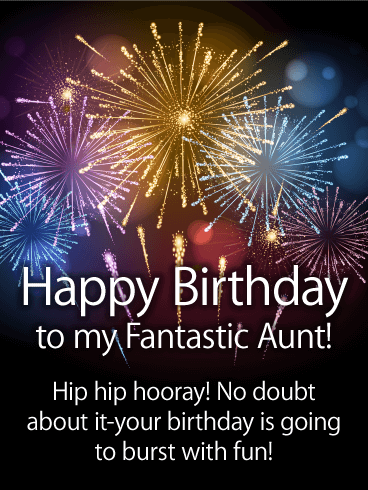 Three cheers for fantastic aunts! 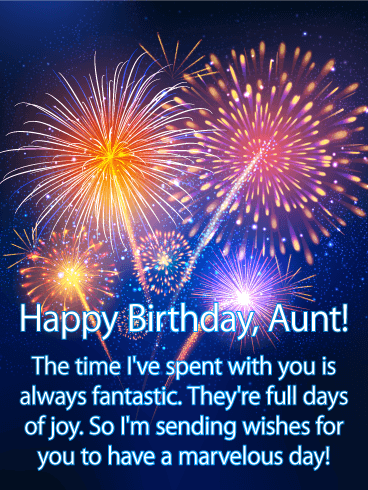 Send this firecracker birthday card to a terrific aunt today. She'll love the bright colors and enthusiastic message. Fireworks burst in the sky over a fun and spirited birthday message. Remind your aunt that it's going to be a great day bursting with fun-no doubts about it! A sparkling birthday card that’s full of high-energy is a super fun way to celebrate your aunt's special day. Birthdays are the best days to let the special people in our lives know that we care. 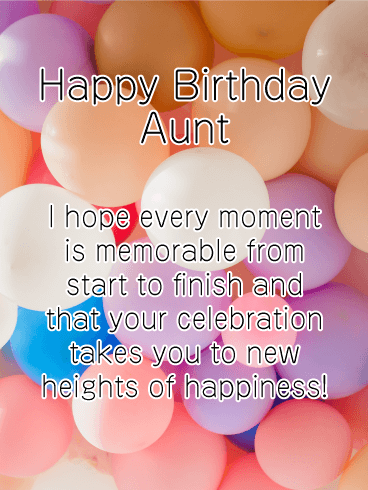 This heartwarming birthday card for you aunt will certainly remind her of that, while bringing your warmest wishes for a celebration filled with warm, happy moments that she'll always remember. A sweet pink heart helps add to your touching sentiment. 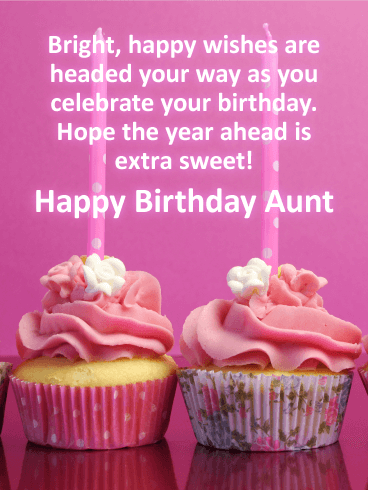 When a special aunt's birthday comes around, let her know you're thinking of her fondly and wishing her well in the year ahead with this heartwarming card. A watercolor rainbow creates a lovely backdrop for the meaningful message you share, a beautiful sentiment to reveal just how you feel. A lush field of green grass, yellow flowers & a butterfly below. A sunny blue sky above. 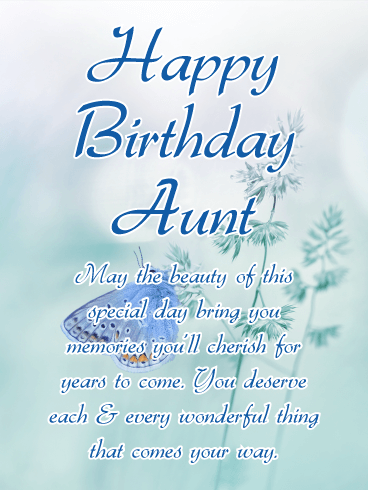 What better way to wish your special aunt a birthday she'll always remember. With its touching words and serene backdrop, this card will make her feel loved & remember today and for many days to come. 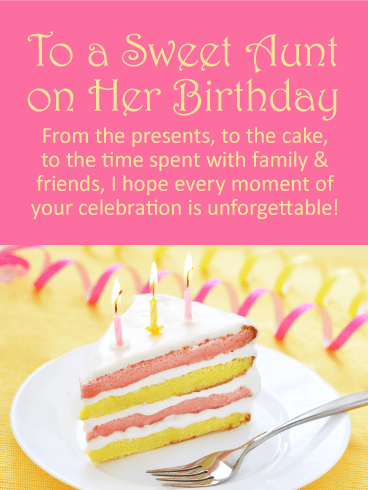 With bright pink and yellow pops of color, including a delicious-looking, candle-topped cake and streamers, this birthday card is the perfect choice for wishing your aunt a sweet birthday celebration! Whether you're there to celebrate, or sending your warm thoughts from miles away, she'll feel touched knowing you took the time to think of her. This cute kitty is here to let your aunt know how much you treasure her! 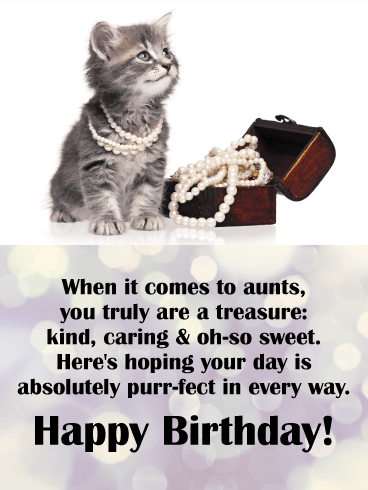 With so many wonderful attributes, she is someone who deserves an absolutely purr-fect birthday in every way, and this birthday card is just the surprise to make that happen. Two candle-topped cupcakes sit side by side, just waiting to be lit up and eaten up after a wish is made! What an extra sweet way to make your aunt's birthday unforgettable. This lovely all-pink birthday card is feminine, fabulous & full of your best wishes to a special family member as she gets ready to celebrate her big day in style! 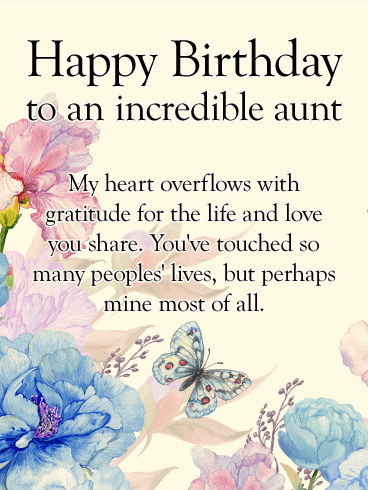 This sentimental birthday card to a wonderful aunt in your life puts your kind, loving words front & center to make her feel special. 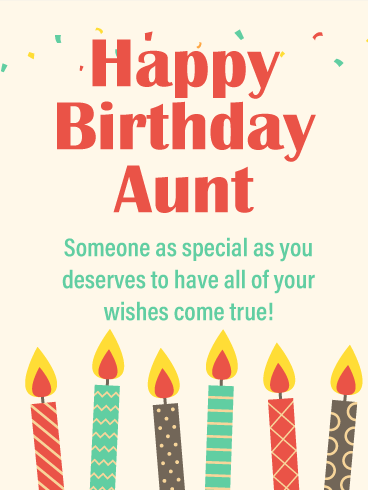 It's a great choice for an aunt whom has played an important role in your life over the years: a chance to tell her how much she means to you while wishing her another amazing year ahead. 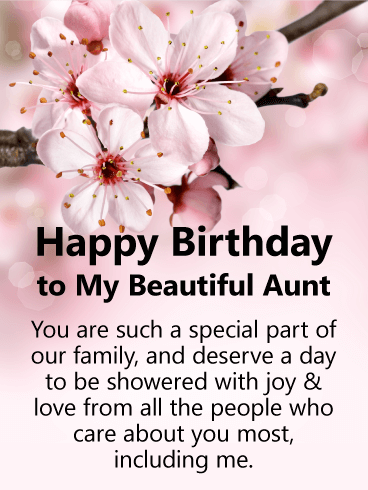 This thoughtful birthday card for your aunt features lovely pink flowers, which add to the beauty of your words. As she celebrates another year, it's a chance for you to remind her how much she deserves a day to be showered with love by all the people in her life who care about her most, especially you. The cat is definitely out of the　bag (or in this case, box) on who's the best aunt around: yours! 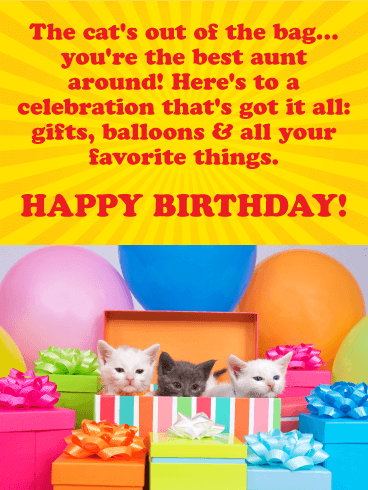 Wish her a happy birthday with this cute, colorful birthday card full of bright gift boxes, big balloons and the cutest trio of kitties, not to mention your sweet greeting, which is guaranteed to make her smile as she celebrates surrounded by all her favorite things. 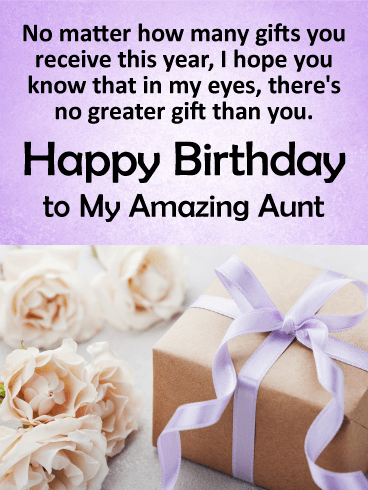 An aunt as amazing as yours is sure to receive many gifts for her birthday, but none as special as being reminded that she is the best gift of all. 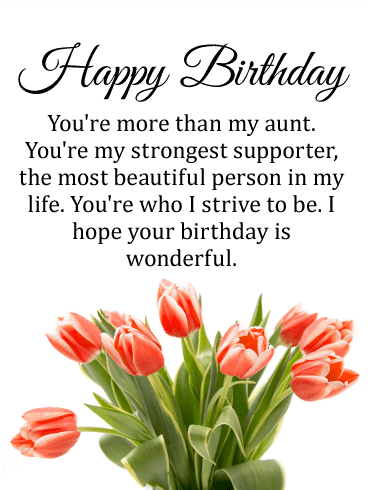 Even if you can't be there to celebrate with her, this card helps convey everything you feel, which is something she'll remember for many birthdays to come.